Phuket Homemartphan Wood Store we are a distributor for all quality products in Phuket of construction materials from BORAL, SHERA, Ha Huang Roof & Concrete Roof Tile, TOA, VIVA Board and HAFELE. Moreover, we also feature iron, concrete, cement, chemicals, PVC and door & window materials including other construction materials. 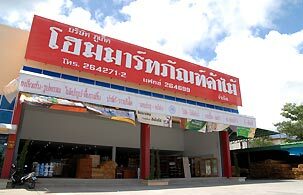 We are a quality wood store in Phuket that provides all kinds of wood for construction. With veneer, parquet, door panel, window frame throughout made to order services in your design and concept. Ensure the quality and delicate workmanship with the deep experience in wood.